Who lives in a pineapple under the sea? So begins the theme song to one of the longest-lasting cartoons to come along in some time, SpongeBob SquarePants, enjoyed by kids and adults alike for 12 years and running. 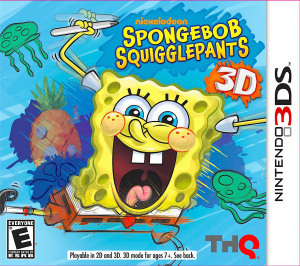 But a license is only as good as the developer handling it, and luckily SpongeBob SquigglePants 3D comes to us courtesy of the more than capable WayForward Technologies. But is this sponge worth giving a squeeze, or is it all dried out? SquigglePants is a collection of nanogames, a term that any WarioWare fan will find suspiciously familiar. 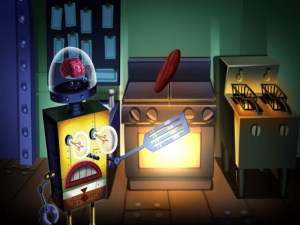 It follows the same formula, presenting a series of simple challenges that last about five seconds each. As such it never gets terribly complex, but a good sized portion of the amusements here are imaginatively designed enough to hold one's interest. They all involve performing an action with the stylus (flicking, drawing, etc), the 3DS (tilting, shaking) or the circle pad. You'll have a moment in between each to rest, the action you're to perform next appearing on screen as you wait. It's extremely easy to pick up and play, and trying to see how well you can do round after round can become quite addictive. There are over 100 games, which when compared to WarioWare Touched! 's more than 180 seems a bit light. While a more robust collection would have helped, the selection here is still satisfactory. It channels the silly, off-beat humour of the TV show quite well, and the fast-paced format ably suits it, heightening it to the point that you might find yourself laughing out loud from time to time. 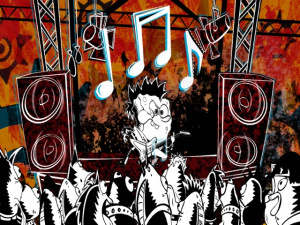 The games are presented in a number of unique series, each with a different art style, which helps keep things feeling fresh and interesting as you go. Some of these are quite impressive and look great in 3D, like the psychedelic, neon-tinted Simply Bob set and the ruddy, paint-covered Punk collection. There's also the extremely charming tribute to 8-bit, PixelBob, with gameplay as well as an aesthetic modelled after retro classics like Pong and Frogger. You can come back to each individual collection, mix them together in Remix or the much faster Hyper Remix, or play one nanogame over and over for practise. Each follows the formula of gradually speeding things up at certain intervals, and after you've made your way through each collection by completing 20 games in a row, you can come back to see how far you get. You can earn medals this way, and your high score is tracked for each, but there are unfortunately no leaderboards. Beyond this, there are a few more complex unlockable mini-games, a video tutorial and Art Studio mode. With a surname like SquigglePants you'd think there would be a greater emphasis on the latter, but it proves one of the most simplistic canvasses since MS Paint. Don't expect to spend much time here, or to be able to save more than one work at a time – not that you're likely to want to, as it's such an unfortunately limited feature. Tom Kenny appears as Patchy the Pirate to guide you along, showing up even after you've completed the game to entertain with a minor narrative about his parrot. It's sure to especially please the younger fans of the show, and those who grow weary of his corny and semi-constant appearances can skip them with the press of a button. The 3D effect generally gives a subtle sense of subtle depth and works well, especially with a few aforementioned art styles, though some sets don't stand out quite so much. With its many palettes, however, it's an attractive and visually interesting experience, with a soundtrack appropriate to each set as well. It's unfortunate that Patchy's video segments are two-dimensional, but the graphically pleasing nanogames more than make up for this. 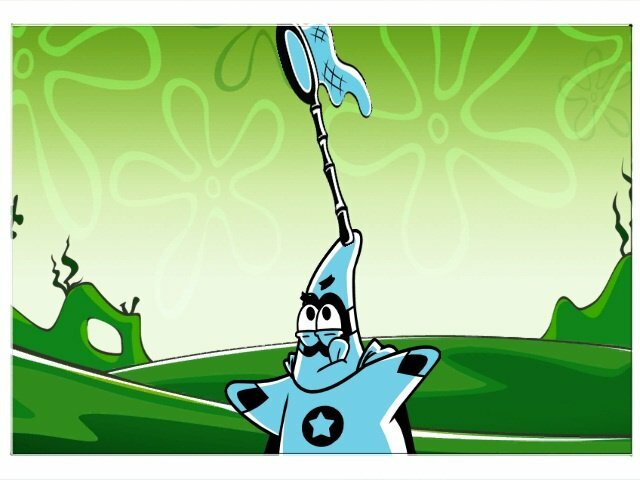 SpongeBob SquigglePants formidably follows the nanogame formula established by WarioWare, and its simplicity, quick pace and silly humour are an entertaining, accessible and addictive combination. Its uniquely themed sets keep things fresh and interesting, a few of them looking great and working very well in 3D. It's held back by its relatively small size and the fact that many of its activities aren't extremely imaginative, but it's still a fun, if somewhat thin, assortment. 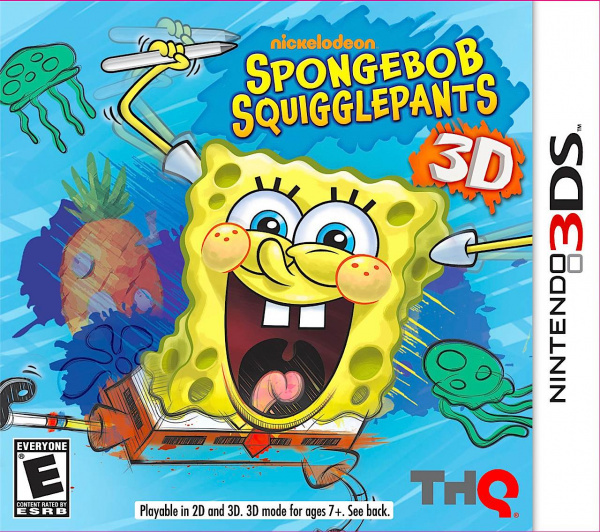 Regarding the game, I like how they have different 'styles' of Sponge Bob in the game. But yea, pretty good game. Don't have it, but looks good! Sounds like the perfect game to tide me over until the next Warioware comes out. Besides, it ruins the song. Got this game for my kid. It was okay, but I wouldn't mind if I never touch it again. This looks fun, but I think I'll wait until Warioware comes out on 3DS. I will persevere until Warioware. I don't care how good this game is; I would sooner destroy my own living room than promote that show. Sorry wayforward, even you can't save it! The "Spongebob Squarepants" cartoon is basically an idiot savant and a plain 'ol idiot acting stupid and calling it comedy (yes, I have seen some of it). Nanogames actually fit it quite well, as they fill a similar position among video game genres. I much prefer some real meat in both my cartoons and my video games. You should watch some of the older ones. The "Chocolate with Nuts" and "Shanghaied" episodes are two of my favorite cartoon episodes ever and there are plenty of other winners. Back then, most episodes of the show weren't just two idiots acting like idiots. It's too bad the show hasn't put out any entertaining episodes on TV since the movie came out. Even the uDraw version is not bad apparantly! The older episodes of SpongeBob are classic. The creativity is off the roof, and it's just such a imagintive, colorful, beautiful and unique show to look at.....Wich you rarely see nowdays in Cartoon ville. The new episodes however have soared down in quality, all because the original creator left the show. Review the Wii version too! I dunno about this one.. Probably saving it until all the good games start to change it up and come our way. I'll pass. Punch Time Explosion probably is going to be better, too many people have been buying this because of a over abused cartoon thats literally the only one Nickelodeon ever airs anymore. I picked this one up today. It is so much fun and a nice little the game. The art studio is a great addition as well. I think it deserves atleast an 8. It's alot better than some WarioWare I have played before. Multiplayer, and this game would be A+ Perfect. Don't pass this one, I don't know what I was thinking before! This game is actually not worth 40 dollars, I think it should simply be a game on 3DSWare for like 10 dollars or so. The game is VERY easy to finish, you can probably finish it in less than a week. After fully playing, this game isn't worth 40 dollars at all. Rachel, someone could probably finish this game in less than 2 hours, lol. @ryan, @rachel: you're brother and sister. Surely you can talk to each other face-to-face about this game? @thehedgehogs But why would you only play through it once instead of going back and trying to best your score? Hyper Remix is a great way to pass the time. I did do that. I feel like I wasted $40, and in my eyes, I did. I wanted money to get The Mercenaries anyway. This game is SOLD.